UBC launched the UBC Sustainability Initiative (USI) in early 2010 to explore and exemplify the principles and products of sustainability, both on campus and in the community, under two key themes. 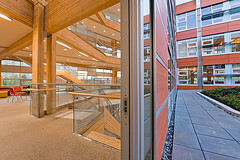 Under the theme of “campus as a living laboratory,” the UBC campus forms a nexus of interdisciplinary activities in research, teaching and learning, and campus operations, allowing us to truly integrate and practice social, economic and environmental sustainability where we live, learn and work. Under the theme of “the university as an agent of change” for sustainability, UBC provides a natural hub for partnerships with communities and the public, private and non-profit sectors. These partnerships ensure a two-way flow of knowledge that fuels research and innovation, adds value to established sustainability efforts and provides educational and employment opportunities for students. The USI coordinates and integrates UBC’s teaching and learning, research and operational sustainability initiatives across all aspects of university life. From 2010 to 2015, I was in charge of the UBC Sustainability Initiative (as Associate Provost Sustainability from 2012-15). This was a remarkable opportunity to learn something about the challenges and opportunities involved in attempts to transform an institution like a university to strong sustainability. For more information, please visit http://www.sustain.ubc.ca/.